Four nights, six films, and one epic, funnel-famous setting. Four Thursdays, six flicks, and one majestic boat nearby: It's a free summer film series at the celebrated Long Beach ocean-liner. 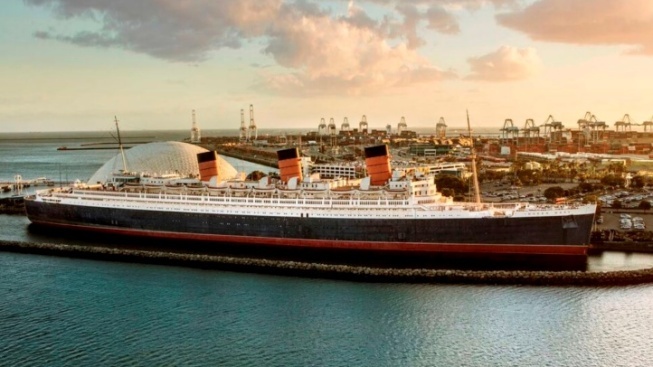 Your heart may go on, and you may, at times, feel like the king of the world, but it is time to face the film-true facts: The Queen Mary was not in 1997's "Titanic," an oft-asked and oh-so-understandable question posed about the Long Beach attraction. The '30s-era ocean-liner, which, yes, does recall the Titanic for many visitors, has been seen on the silver and small screens multiple times, in everything from "The Poseidon Adventure" to "The X-Files." Making it, of course, an ideal place to settle in for a summer flick shown under the stars. And if that movie is free? As in, you'll pay no admission? As in, wait a moment, you will pay $10 to park, but nothing to saunter into the film-watching area? Well, for sure: You are going to feel as queenly as the ship herself, or, if you prefer, like the king of the world. In short? You'll be jazzed. And that jazzed feeling will begin on May 16, 2019, when the Queen Mary's just-announced Summer Movie Series opens. It will roll over four select spring-to-summer Thursday nights, with a pair of double features popping up on June 20 ("Raiders of the Lost Ark" and "Indiana Jones: Temple of Doom") and Aug. 22 ("Beetlejuice" and "Edward Scissorhands"). The singly shown films to anticipate on May 16 and July 11, respectively? "Mamma Mia!" and "Grease." Now that we think of it, the ocean and boats do play a part in a few of the flicks, including "Raiders of the Lost Ark" and "Mamma Mia!" Nice choices, Queen Mary. Good to keep in mind? The "grassy lawn" area adjacent to the Queen Mary is where all of this film-loving fun will sprout, and not on the ship itself. Also? Food trucks "themed to the film" will pop up, as will a bar for guests 21-and-over. Also? There's a date night package, for $75, which includes a reserved couch and bottle of Queen Mary bubbly plus "assorted snacks." But, of course, go for free, if free is your jam, and you love to start your summer (or almost-summer) weekends on a Thursday night. The Queen Mary is no less than a movie star, and that six starry cinematic treats are ready to unspool in her presence, from May to August 2019, seems like a fitting way to enjoy a free film.